Sometimes a small investment in a particular place, such as a new mural, plaza or community garden, can be a powerful catalyst for positive change in a neighborhood. LISC has provided numerous small grants and loans to help neighborhood partners make targeted improvements that add beauty, attract pedestrian traffic or improve safety. For more information about LISC's placemaking initiatives, contact Jake Ament. Belmont Cragin celebrates the completion of its quality-of-life plan, which is already having an impact in the community, and planning continues in Auburn Gresham, Englewood and Chicago Lawn. A new group of community organization members is learning the ropes of planning through the Chicago Plans workshops. The Cubs Charities Diamond Project is improving community baseball fields throughout the city. And making plenty of kids happy. Subsidized bike share program continues through five Financial Opportunity Centers. The Forum at the 22nd annual Chicago Neighborhood Development Awards ceremony addressed different perspectives about how to develop underserved neighborhoods. An unusual group of large-scale projects filled the winner’s circle at this year’s CNDA ceremony, new evidence of what’s possible when resources link up with local ideas and energy. 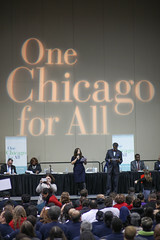 The 22nd Annual Chicago Neighborhood Development Awards ceremony is Thursday, February 18, at the Chicago Hilton. The high-energy planning meeting in the Northwest Side neighborhood gathered final details from residents and gave other local LISC partners new ideas for their own quality-of-life planning process. Brighton Park residents celebrate new football field at Kelly Park. Chicago Plans provides participants with the theory and skills necessary to convene community-planning processes rooted in inclusivity and meaningful engagement. Everybody loves The 606. But conversion of the old rail track into a popular walking/cycling path is having unintended consequences for some long-time residents. A new playing field opens in Marquette Park. Cal Ripken Jr., Cubs, and neighborhood organizations lead celebration. Slow Roll Chicago organizes weekly bicycle rides in underserved Chicago communities to promote cycling, fitness and neighborhood pride. Recent rides were in Englewood and Little Village. A far-ranging and frank conversation about issues of race, class and gender at the LISC community organizing and engagement workshop series. The 22nd annual Chicago Neighborhood Development Awards ceremony is on February 18, 2016, at the Chicago Hilton & Towers. Applications for the awards are due on September 10, 2015. As the private sector soars and the public sector shrinks, flexibility and nimbleness rule the day for neighborhood developers. From a fast-unfolding plan to redevelop the historic Pullman District to the rehab of a run-down SRO hotel on the North, the 2015 Chicago Neighborhood Development Awards had the city covered.